Maryland is implementing a community solar pilot program that will run from 2017-2020. Starting in June 2017, subscriber organizations began the application process to connect their projects to the grid and subsequently request space in the program for each project. Once a project joins the program, subscriber organizations will likely begin seeking subscribers/customers. The timing for this will vary by project, but several projects are open to subscribers now. The sun shines everywhere in Maryland. But too few of us could take advantage of it before community solar came along. Community, or shared, solar makes it possible for anyone with an electric bill to access solar energy, even if they can’t put it where they live. With community solar, you can purchase or lease a “share” in a community solar project or start a project with your neighbors. Every month, you receive a credit on your electricity bill for the energy produced by your share. Roughly 196 MW of total installed solar capacity will be allocated over three years. Three-year pilot program ending in 2020. Equivalent to all volumetric charges, applied as a dollar or kWh credit. Baltimore Gas & Electric, Delmarva, Pepco, and Potomac Edison. Any person or entity in the state with an electric meter account, but subscribers must be in the same utility territory as the solar array. Project developers are in the process of putting together community solar projects. As we hear about them, we’ll add them to our list of open community solar projects and let you know about options to subscribe. In addition to traditional developers, community members are also working together to develop community solar projects. A community solar project can be located on the rooftop of a building (e.g. church, apartment, or warehouse) or on a piece of land. There are no restrictions on the types of buildings that can host community solar projects. View our resources for starting community solar projects! 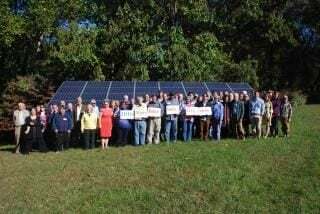 Community Solar in Maryland – Year 2 – We’ve updated our report with examples of community solar projects that are active in the state. Community Solar in Maryland – Year 1 – Download this first-of-its-kind report about the first year of the Maryland community solar program from Solar United Neighbors. Community Solar: What you should know and how you can help! – Read this blog post from Solar United Neighbors for an easy to read rundown on why community solar is important for Maryland! 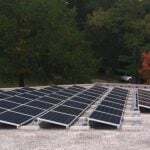 List of Maryland community solar projects – This is a tool Solar United Neighbors developed to help you evaluate existing community solar projects. Community solar for landowners – These guides help landowners understand the opportunities and implications of leasing their property for solar installations. Solar United Neighbors of Maryland, then known as MD SUN worked closely with a wide group of community organizations and activists to convince the Maryland legislature to pass community solar legislation. 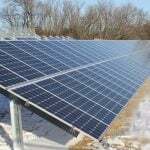 The Maryland legislature passed the Community Solar Energy Generating System Program into law. The pilot program must run for three years before the legislature will consider making it permanent. The Public Service Commission (PSC) finalized program regulations. All participating utilities filed their tariffs for their service territories. The PSC accepted finalized tariffs from BG&E, PHI (Pepco & Delmarva) and Potomac Edison, marking the launch of community solar in Maryland! Is your house too shady for solar? Do you rent? Try community solar! View our list of the community solar projects in Maryland that we’re tracking so you can sign up today! Download our Community Solar in Maryland Report! 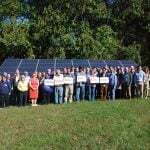 Maryland’s Community Solar Pilot Program is now in Year Two. We take a look at how it’s progressing with specific case studies and steps the program can take for future success. Support Clean Energy Jobs in Maryland! Contact your representatives to tell them you support the Clean Energy Jobs Campaign to strengthen the local clean energy economy by moving the state’s RPS target to 50% by 2030 and increasing the requirement for in-state solar to 14.5%.